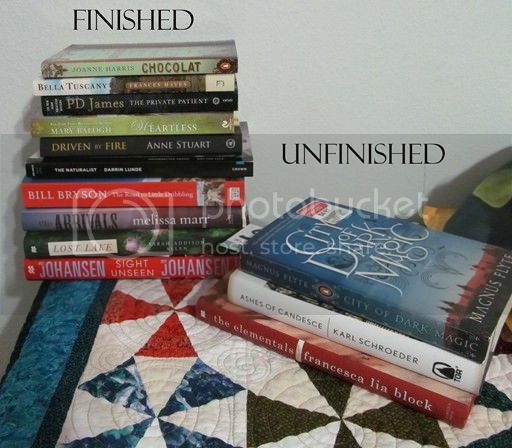 I read ten books in a week; ten and half if you count the partly-read City of Dark Magic on the unfinished pile there. Bill Bryson's The Road to Little Dribbling slowed me down toward the end. I can't seem to read Bryson speedily. How did you all make out? Let us know in comments. You did really well to get through so many in such a short time. I look forward to reading your reviews. I usually plough through a book in 2 days or less, but the series I'm reading at the moment isn't holding me as much as usual so I'm finding it easy to put down and do something else. Not like me at all, so I'm now behind on my reading challenge for 2016. I've reached book 5 and finally this one is gripping my interest, so hopefully I'll zip through this and on to the next to finish off the series.